We offer our clients high quality Needle Burner ASNB-10, that are fabricated using superior quality materials. These products are well acknowledged for its superior quality and durability and finds wide applications in medical, dental surgery and surgical clinic, Health units. Available in various specifications, these can also be custom made as per the clients requirements. 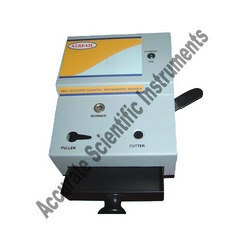 Moreover, we offer these Needle Burner ASNB-10 at industries leading prices. Insert the needle in to the Needle Burner hole and press the MAINS switch ON for some time. Insert the syringe in to the HUB SEPARATOR hole. Hold the needle head in the corner and pull the syringe upwards to separate the burnt needle. Insert the nozzle of the syringe in to the SYRINGE CUTTER hole and pull the lever towards you. Looking for Needle Burner ?